The Church of Saint Eleftherios was established by a group of determined Greek Orthodox Christians. The first official service took place on Holy Thursday night the 2nd of May, 1918. The Community from that day on had a rapid growth. One newspaper had written at that time, 'The secret success of this Greek Community can be found in that they maintain the unity of all its members. They are dedicated to their high ideals of love and harmony". The Church' of Saint Eleftherios has gone through many crises. No matter the crisis with the, blessings of Almighty God and through the intercessions of Saint Eleftherios, one by one they were overcome. Even one morning in 1973, flames began consuming the Church from top to bottom. Yet with the support of so many people and the determination of the President, John Mallios, the Church was rebuilt. The Church of Saint Eleftherios is a historic Church. 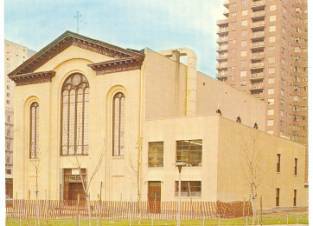 In the late twenties and early thirties due to the burning of the Cathedral of the Holy Trinity, the Church of Saint Eleftherios was designated as the acting Cathedral of New York. 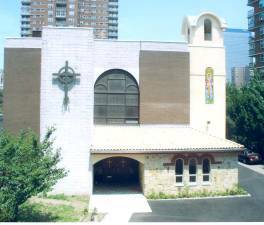 With the establishment of the new Archdiocese and with the arrival in the United States of Archbishop Athenagoras, his enthronement took place in our Church as the acting Cathedral. Again the Church was called upon to host the first Clergy-Laity Congress in the Church Hall. We can say that our Church played a major role in the formation and organization of our present Archdiocese. Yes, eighty-six (86) years later the Church of Saint Eleftherios is still offering a special place for spiritual refreshment. Prayer in a quiet relaxed atmosphere. No huge crowds, pushing or shoving. A place of serenity. A place where one can peacefully connect with his/her creator through prayer.